GPS maker TomTom has announced its new TomTom Go Live 1535m GPS system, which the company claims is the first portable navigation device to ship with a suite of popular travel applications. Out of the box, the device wil ship with integrated apps for Twitter, Yelp, Expedia, and TripAdvisor, making it easier for travelers to get information they need—like restaurant locations and reviews, hotel information, weather forecasts, and fuel prices—while they’re on the road. “By giving people the most up-to-date traffic details as well as relevant local content provided by travel apps, TomTom is bringing a new level of connectivity to drivers by providing information in the most effective platform available,” said TomTom president Tim Roper, in a statement. The TomTom Go Live 1535m features a 5-inch touchscreen, voice recognition with one-step address entry, Bluetooth hands-free calling, and advanced lane guidance. 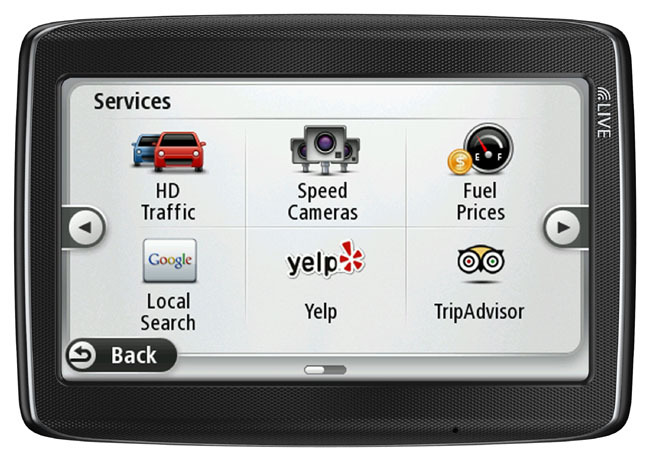 Depending on the country where users buy the device, customers can subscribe to TomTom HD Traffic for up-to-date traffic information—the service includes primary and secondary roads in the United States, and can recalculate routes based on new traffic data. The Go Live 1535m comes with maps of the U.S., Canada, and Mexico, along with up to four map updates per year until the devices “useful life” is over. TomTom says the Go Live 1535m will be available in October with a suggested retail price of $249, which includes 12 months of TomTom Live services. Folks who already have the Go Live 2535m will be able to download the apps to their devices sometime this fall.